If you have a digital camera that produces a RAW format, this is the negative that needs to be processed. Using a photography editing software program you can sharpen the picture etc and this type of editing is not any different than using chemicals in a darkroom. Some feel that any further editing like touching up basic exposure and colour modifications are basically accepted as part of the darkroom procedures but modifying colours or tones within a section only of a photograph is considered image manipulation. Removing objects at the time you take the picture rather than later in a photography editing software program is acceptable. To setup a background for taking a picture is acceptable but many would say that if you replaced the background in an editing program that is just manipulating the image and that is not acceptable. I believe it is up to the individual on how they want to deal with removing objects by either doing it at the time they take the photograph or later using digital software. My view is that I am happy to tell you how I arrive at my photographic composition. I may use several photos to make up one picture and if I do that I would say that I manipulated the image. The bottom line for me is I see photography as an art form not just a photograph. Removing objects from a photograph while you are in the field taking the picture, although harmless so you think and it gives you a clearer or neater picture, if you are doing nature photography you might want to consider the impact on the wildlife you are photographing. 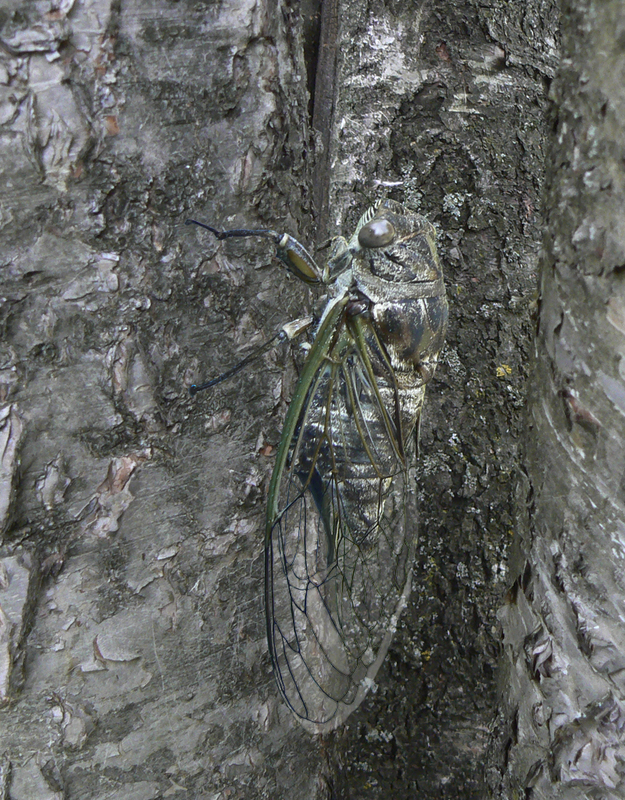 For example I had the opportunity to take a close up picture of a cicada. 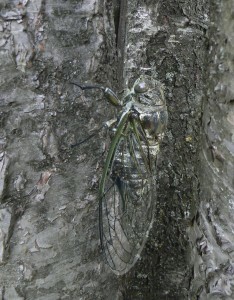 I didn’t want to move or disturb the cicada I originally photographed on a leg of an outdoor chair. I had an idea that I’d like to see how it looked in its more natural surroundings of being on a tree. I took tree photos separately and combined the two to create a photo I feel has more appeal. This is Bob the Stray Cat. At first he would run away at the very sight of people. Bob came around when nobody was about to eat the food left outside for him. After seeing me day after day, and after I talked softly to him and aptly named him Bob( because of his short tail) he began to respond by rubbing around my legs and stayed around while I brought him food. 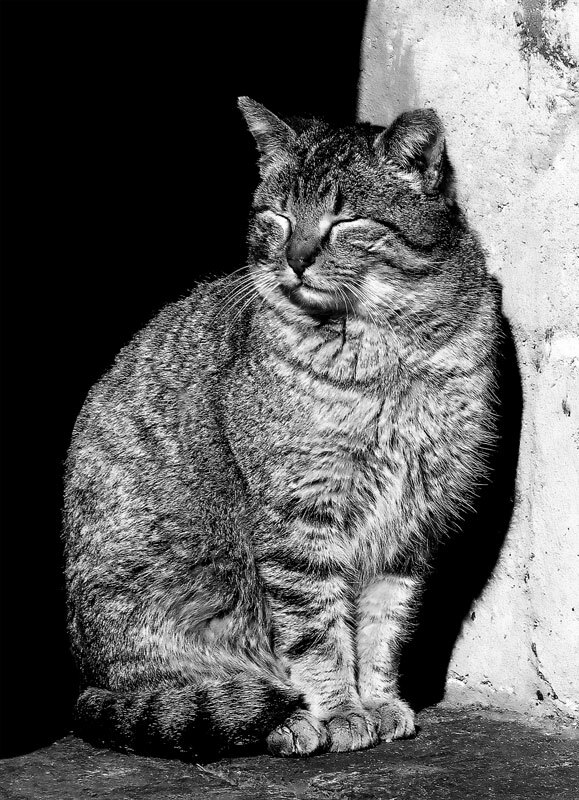 The background is suited to the fact that Bob is a stray. He stays away from most people but Bob is getting friendlier. This photo represents how I see him. Sometimes hiding in the shadows and sometimes coming into the light. 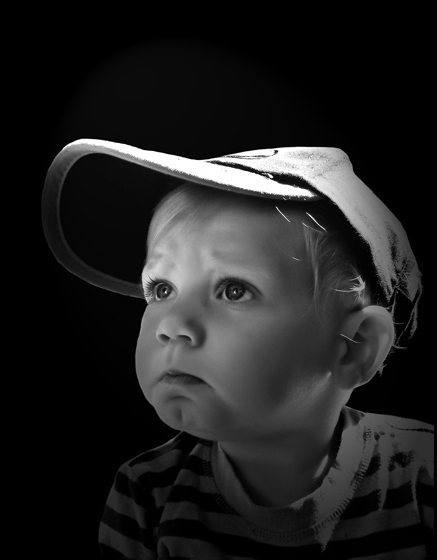 If your camera is capable of capturing in a Grayscale mode, resist the temptation to use it. It may seem fast and easy to do, but for capturing the highest quality image you will gain a higher quality image if you use RGB capture. A coloured photograph that is edited in a software program such as Adobe PhotoShop will add more depth and range to your photo. This photo was originally in colour. The photo was edited in PhotoShop – converted to Grayscale and tweaked so that others could see what I saw – the intense look which by converting it to black and white I put the focus on the subject capturing the mood I wanted others to see. Let me say that I am not a professional photographer, nor do I use professional equipment (these statements will become obvious as I post articles here) but I do like taking photographs and I use a point and shoot digital camera. I take photographs for my own enjoyment and what I want to share with everyone is that taking pictures can be fun and a creative outlet. I don’t have the time or inclination to spend hours reading photography books (although I have read some) or taking courses and nor do I want to spend a vast amount of money on camera equipment. I’m happy to recognize my limitations and just get out there and enjoy finding things that I would like to take pictures of. I truly admire professional photographers and their abilities. I believe that if you have a special occasion or event that you want to capture on film, you should hire a professional photographer because they not only have the know-how to take great pictures but they also have the professional equipment which allows for amazing quality as well. I believe even with a ‘point and shoot’ camera that you can express your creative nature. There are two sides of photography. The technical side often results in beautiful pictures that are clear, have the correct depth of field etc and even with a point and shoot camera you need to learn a certain amount of technical know-how. The other side is the art side of photography, the photographs that show emotion and are a visual expression. The first step in enjoying the creative side of photography requires that you gain some technical knowledge. Take your point and shoot camera and get familiar with the different settings and learn what the camera can do. Once you are comfortable with the technical aspects of your camera, you will now have the freedom to focus on the artistic side of photography. The artistic side requires you to feel, use your emotions to respond to the things you want to photograph and you will be well on your way to enjoying the creative side found in taking photographs. A garden is a lot of work to create and maintain but the rewards are immeasurable. My ideal garden is a place to relax, contemplate and re-new my spirit. The design, layout and planting is exciting creative work. The hard work of digging and making pathways is not only good exercise, but leaves one feeling deeply satisfied with the accomplishment of creating and working with nature. If you use your creative abilities, your garden with greenery ,colourful plants, possibly a water feature, a pathway and a place to sit can become an ideal space to meditated , inspire your imagination and connect with nature and local wildlife. Sometimes life gets in the way of creativity. It is hard to explain. The heart, mind and body have to be in sink and your mind needs the quiet, right atmosphere and surroundings to put you in the right frame of mind. Whether your creative nature is writing or drawing or photography you have to be able to go to that creative place within yourself in order to produce anything worthwhile. Often inspiration can be found in many places. Inspiration helps to open that creative place within you and often gives you the incentive to push your abilities beyond your own expectations to the point you surprise yourself. Some people can produce creative results on demand. The question arises is this a creative work or is it an example of technical know how. For example if someone asked you to write a poem about the moon or a book about the mysterious disappearance of a valuable artifact. Can you write it on demand because you easily go to your creative place within yourself and find the way to do it or do you write it on demand because you are able to follow the rules of writing poetry or the formula for writing mystery fiction? You need to take whatever creative nature you have and take it one step beyond (think outside the box), work hard using your knowledge and techniques and have the passion to achieve your vision in whatever creative project you undertake.